MJP AP BC Residential Schools Principals Recruitment 2019, AP BC Gurukulams Principals Recruitment 2019, Download the application form of MJPAPTBCWREIS Principals Recruitment 2019, Last date to apply for Principals Recruitment 2019. Mahtma Jyothiba Phule AP Backward Classes Welfare Residential Educational Institutions Society(#MJPAPBCWREIS) has published the Principals Recruitment notification for AP BC Residential Schools for Backward Classes. 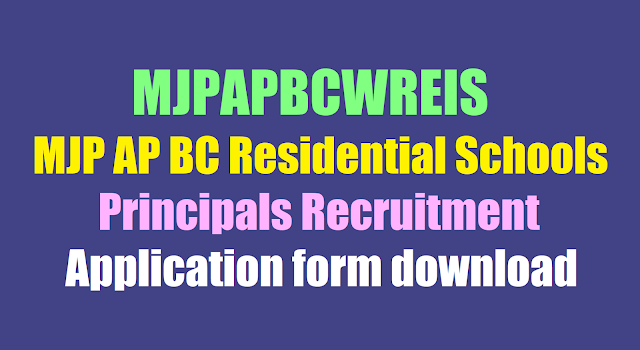 MJPAPBCWREIS invites the application forms from the interested personnel for recruitment of Principals. Mahatma Jyothiba Phule Andhra Pradesh Backward Classes Welfare Residential Educational Institutions Society (MJPAPBCWREIS), Vijayawada seeks application for the position of Principals for 16 Residential Schools (new and existing) for Backward Classes on Contract Basis. The announcement was made to the principal vacancies in the Mahatma Jyotibha pule BC Welfare School in the state. Mahatma Jyothiba Phule issued the announcement of the Principals in 21 schools on the basis of the agreement and Prof. B. Lakshmi, Director of the Center for Human Development - Administrative Staff College of India, on behalf of the Andhra Pradesh BC Welfare Residential Educational Institutions Society. Candidates applying for this job should have a Degree from any university recognized university with a minimum qualification, B.Ed or M.Ed. Applications have to be sent on or before January 28th by 5 pm. Applicants must be from Andhra Pradesh and have computer knowledge. Maximum age can not exceed 65 years. Rs 40,000 a month is paid for honor. Any 10 years work experience in any public school is also mandatory. Women candidates in women's schools are of high priority. Those who have already been retired in social and tribal welfare schools can also apply. Candidates sent by applicants are selected by the applicants for interviews by SMS / Email. 5) The maximum age limit is 65 years. Payment: Fixed remuneration of Rs.40,000/- per month. Tentative Date of Interview 02, February, 2019. Shortlisted candidates will be informed by SMS /email. Send your application by post or email latest by 28th January 2019, 05.00 PM. Late applications will be summarily rejected. Envelope should be Superscribed as “Application for the Position of Principals”.